• Doors can be locked and unlocked pressing the lock button(1) and unlock button(2) on the folding key. 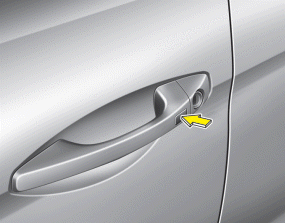 Once the doors are unlocked, they may be opened by pulling the door handle. When closing the door, push the door by hand. Make sure that doors are closed securely. For more detailed information, refer to "Folding key" in this section. • Doors can be locked and unlocked pressing the button of the outside door handle with the smart key in your possession. • Doors can be locked and unlocked pressing the lock button(1) and unlock button(2) on the smart key. 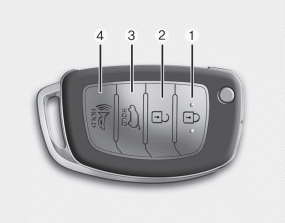 For more detailed information, refer to “Smart key” in this section. 1. Unfold the folding key or remove the mechanical key from the smart key. 2. Insert the key into the hole of the outside door handle. 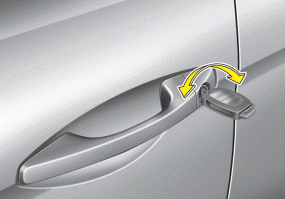 Turn the key toward the front of the vehicle to unlock and toward the rear of the vehicle to lock. 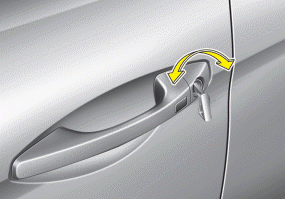 In cold and wet climates, door locks and door mechanisms may not work properly due to freezing conditions. 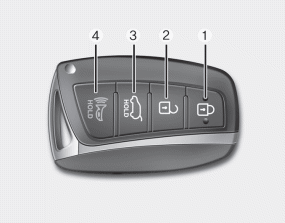 You can activate or deactivate the Tow Turn Unlock function. Refer to "User Settings" in this section.